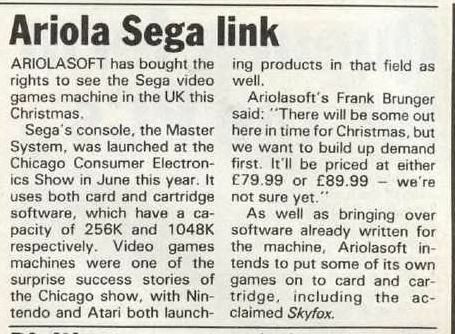 The Sega Master System was on sale in the US and Japan but had yet to reach Europe when PCW, on 11 September 1986, reported that Ariolasoft had been appointed UK distributors. They clearly did not do a particularly good job because in 1987 the UK distributorship was up for grabs, and Mastertronic grabbed it. Ariola closed their UK arm not long after. Wikipedia informs me that Ariola continued to be the German distributors until 1989. In 1992, following the formation of Sega Europe, Sega established its own distributorships in the main European markets.